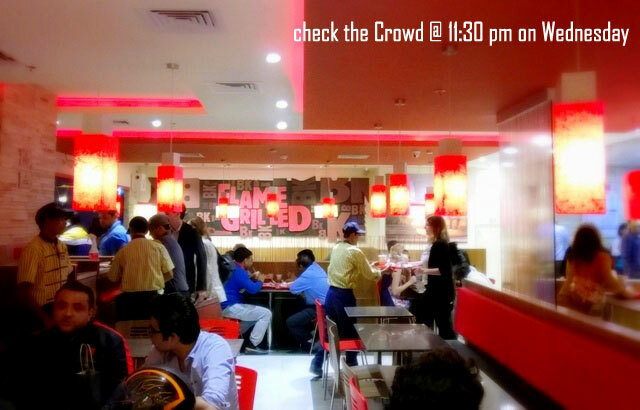 The food fanatics of Delhi have won another chase as Burger King chooses us for its India launch (over Mumbai or any other Metro, although they might not even realise they are in a race for us Delhiwallas its almost a war victory!). 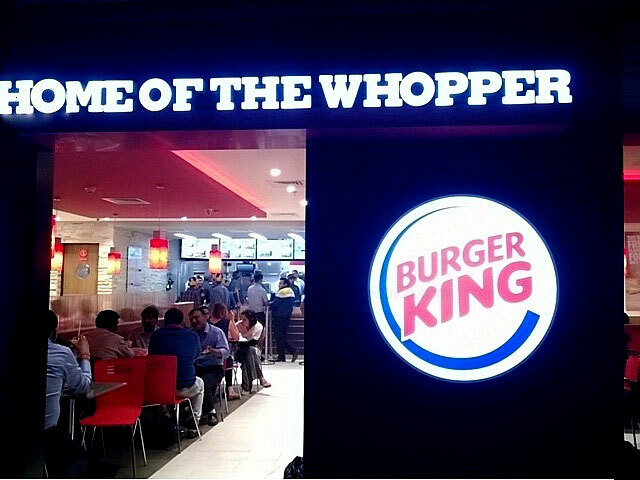 The world’s second largest burger chain the ‘Burger King’, or ‘BK’ as it likes to call itself, opened its first outlet in the upscale Select City Walk shopping mall in South Delhi last Sunday. So finally now, Delhiwallas won’t have to travel all the way to Thailand for a ‘whooper’ and the selfies glutting a large burger with the Burger King sign in the backdrop for an FB update. All that can be done right here in the heart of Delhi now, and yet despite the urge to stamp it on day one we let it pass, to allow the frenzy to settle. So it was a midweek late night slot that we choose and dropped there yesterday and to my utter surprise the mayhem doesn’t seem to have settled yet. 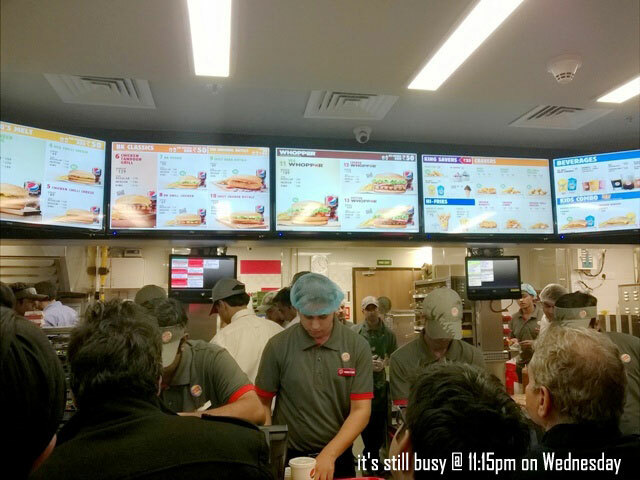 Not so much being a fast food fan myself I’ve never quite been able to understand the craze, but the fact remains that at 11:15 in the night there was an unmatched commotion at the counters of Burger King . The menu that has been modified in hope to suit the Indian palate and the pocket. I am told that the basic combos here are cheaper than the rival McDonalds’, that’s something bold and smart to attract the masses. The service is commendable; especially the speed at which they are able to manage the poring crowd is unmatched. So it was a wait of 5mins tops and our tray was ready at the counter. 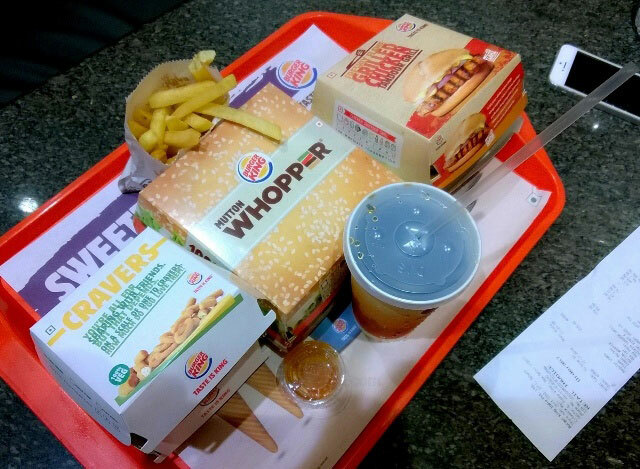 The menu like I said is modified, so do drop your hopes at finding a Cheeseburger or the infamous ‘Beef Whopper’. 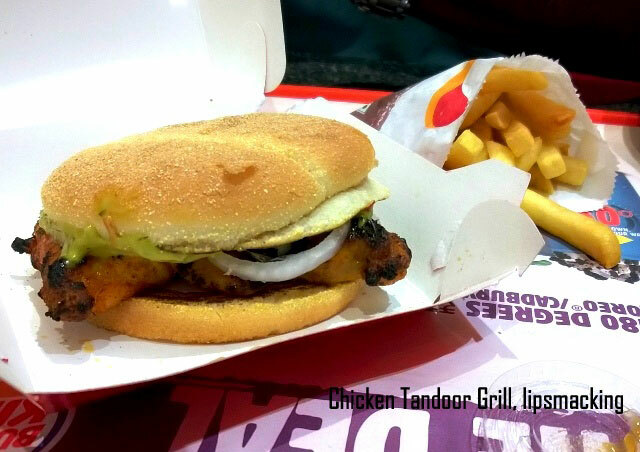 So among two of us we put to taste test a Mutton Whopper Combo and A Bk classic, Chicken Tandoor Grill burger alongside an 8 piece Fiery Rings. The burgers were fresh, the patties were nice and juicy, good fresh bread, perfectly paired with the respective sauces, what else can you ask from a burger. To my utter surprise even the Tandoori Chicken Grill was absolutely delicious, I mean the meat was grilled to perfection, deliciously juicy tikkas, onions and mint chutney, bang on the Indian palate. The whopper on the other hand was a cheaper incarnation of a true quarter pound patty burger, but for the price they are serving I guess I don’t have any complaints. The fries are good too, served fresh and crisp. The Fiery Rings are okay for a side crunch too, but there’s nothing fiery about them really and though I’d expected to it be onion rings but it’s a mashed up onion, potatoes and cheese in a secret combination of course. The burger king, that is if they maintain their current standards service, freshness of the ingredients and the price list, shall have a good future in here, atleast as long as no new rage forays into the country. 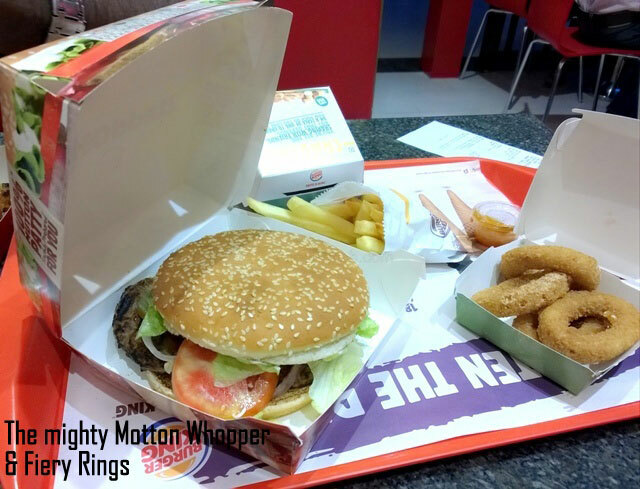 So to sum up, you can count on Burger King to satiate your Burger cravings and with a plant to open at 10 locations in Delhi, it won’t be much difficult to find one at a close proximity. Ps- Our bill for the above order, i.e tummy full meal for two, was about Rs 470, a good value for money I’d say. 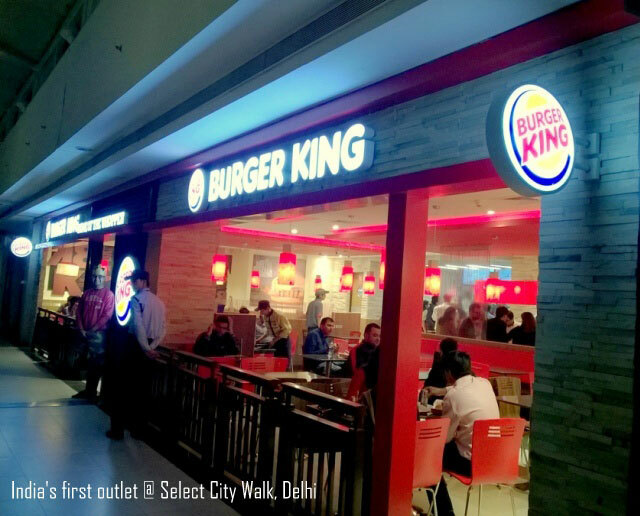 Review Burger King, Select City Walk, Delhi: The world’s second largest burger chain the ‘Burger King’, or ‘BK’ as it likes to call itself, opened its first outlet in the upscale Select City Walk shopping mall in South Delhi last Sunday. Is it better than McD. price and taste wise? Frankly if I had to take a call based on what we were served here at the first outlet, Yes it was better than McD.. Nicer , fresher burgers…Hope they maintain the standard in the days to come and not go down the way McD has in terms of quality (talking from 2 recent encounters of poor unfresh burgers at McD) Though there are no student pocket friendly options for 30-40 bucks but a combo of basic burger here was comparable or even less.. If your burger lover? Then this place is only for you. You can enjoy here various types of burgers. Me and my friends visit there last Sunday. we enjoy there a lot. The service and quality both are very Good.